With these adaptors it is possible to use aircooled type 3 manifolds on the waterboxer engines, allowing the use of twin carburettors and hexbar or bellcrank type linkages. 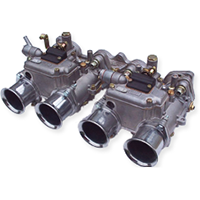 The type 3 manifolds will allow the use of Weber ICT or IDF or Dellorto DRLA carburettors and give adequate clearance for short air filters. Made exclusively for us to our design in the UK from aluminium. Click here to jump to the adaptors in our webshop.